Firstly.. credit to my brother for the exceptional wordplay which is the title for this post - he used it first. Also.. congratulations on your engagement. One day I would like to get married and be good at wordplay. Two weekends ago (23rd/24th April) I was down in London supporting my elder brother in the London Marathon. He also ran the marathon last year and is the reason that I started running again. I have applied again this year, and will hopefully get to race in 2017. He completed the race in 3:43:53 which was an improvement on his time from last year. Whereas last year I did not see him once (even though I had basically run a marathon myself travelling around London). 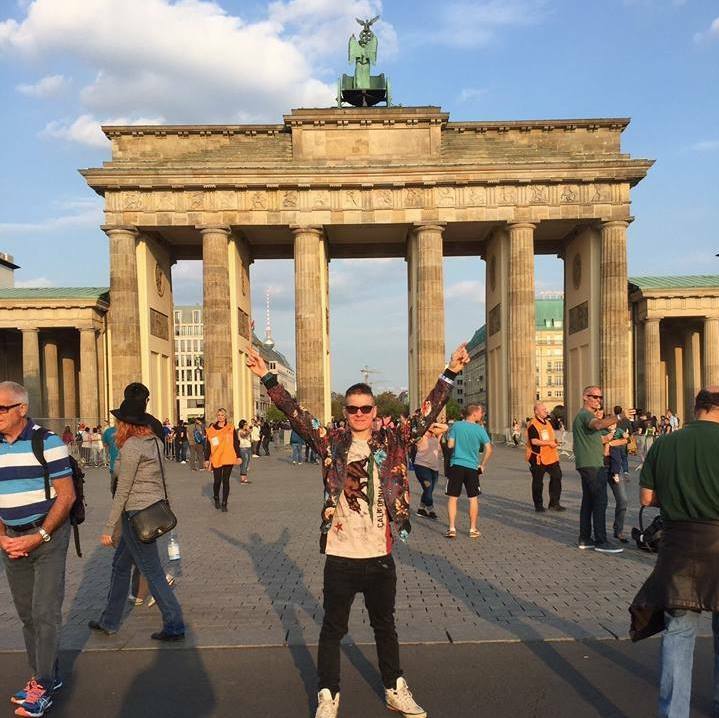 This year I saw him 3 times ! I went to Canary Wharf where you can quickly get from Mile 15 to Mile 18 (it loops around), and where the crowds are a little thinner. I also saw him at Mile 22 but the crowds were too thick and he couldn't hear me. This year I knew what he was wearing, and because (weirdly) no-one else seemed to be wearing red shorts he was relatively easy to spot. After spotting him the first time (and because at this point he was running a fairly consistent pace), I also knew that he was shortly behind 'BOB The Lobster' (a man named BOB (at least that is what his shirt said) dressed as a lobster). At Mile 22 there was a man who told me that his surname was also Charles. I did not find this interesting. Running a marathon is impressive. Beating your PB is awesome.. but doing it after having gotten engaged - excellent work. I am still a little hazy on the exact details of the engagement. 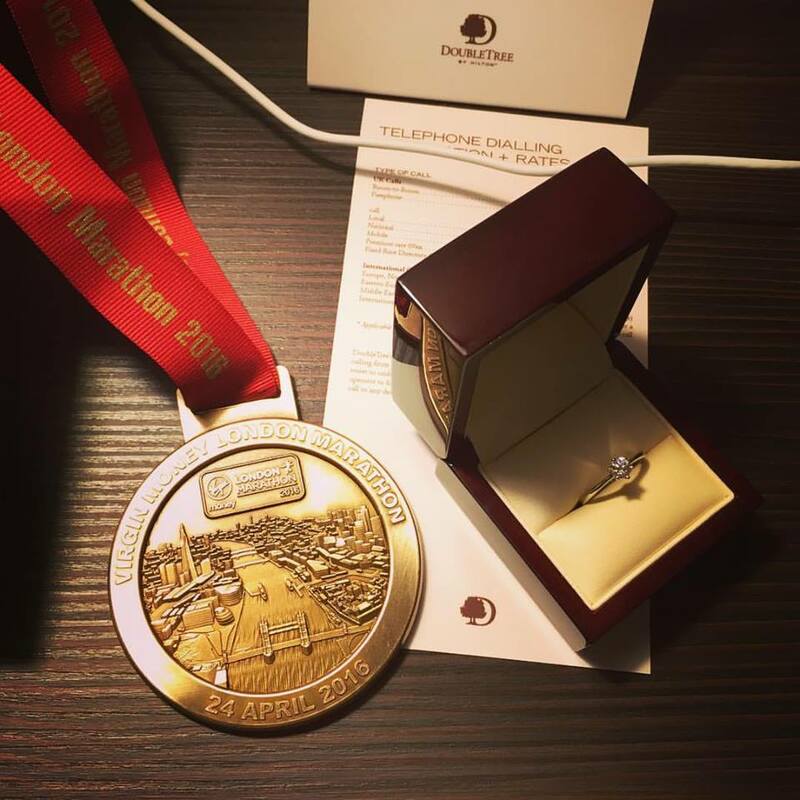 I tried not to ask too many questions beforehand (as I figured that organising a proposal and running a marathon would be pretty stressful). Then.. afterwards.. whilst celebrating I consumed quite a bit of Whiskey. As such some of the insight I may have garnered may have been removed from my memory bank. 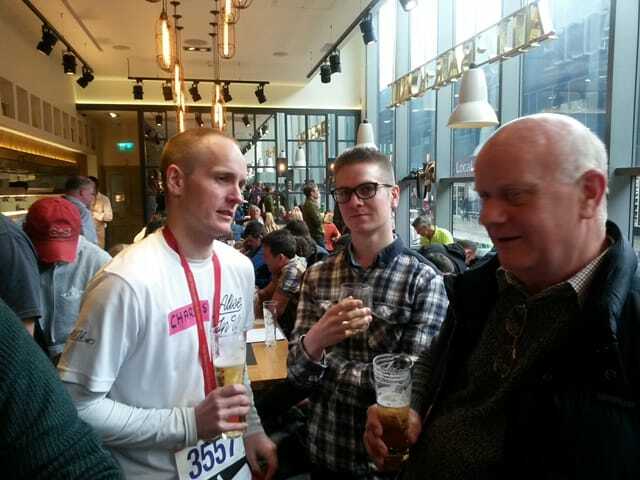 In this photo my brother explains to my father that a marathon is 26.2 miles - he wretches at the thought whilst I wonder to myself as to why my mother is taking a photo. We went to Prezzo at Euston for a celebratory meal - it was really rather good. I felt like quite the pig eating a giant piece of pork belly (then again, I guess pigs don't eat other pigs..). I couldn't even justify it by saying I had run a marathon. My brother just had a pizza which was bemusing to me given my habit of eating all of everything after racing.